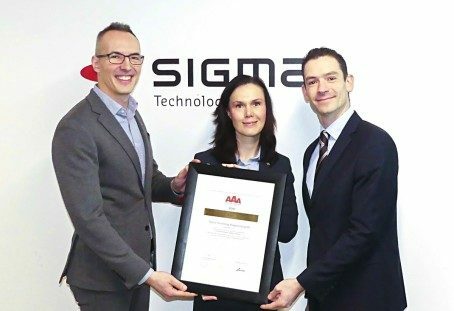 Sigma Technology Hungary has received an AAA rating from Bisnode for the fifth time in a row. The triple-A rating from Bisnode is awarded to enterprises with the highest financial stability and business reliability and is well established in several countries across Europe. In the Nordic countries, Bisnode certificates carry the weight of a credit rating system. Sigma Technology Hungary has been a holder of Bisnode AAA (triple A) certificate since 2013. This certificate is awarded to companies with the steadiest financial standing (currently, it’s 0.63% of Hungarian companies). The evaluation for a Bisnode certificate is focused on financial stability and business reliability of the company and is based on a proven system that has been designed by international experts. Bisnode is a member of the Sweden-based Bisnode Group, Europe’s largest business, marketing, and credit information agency. “Bisnode certificate proves that our everyday work as a reliable player on the market translates into a trust of our partners and recognition of independent experts, such as Bisnode. This is a message for all of us at Sigma Technology that we are on the right track when it comes to building a great company,” says György Nagy, Country Manager at Sigma Technology Hungary. The basis of the Bisnode certificate is Bisnode’s rating system, which has been used for rating companies in view of their reliability since 1908. Issued with AAA, AA, and A ratings, Bisnode certificates indicate the stability of companies, and that companies in possession of such ratings – i.e. Bisnode certificates – have steady financial standing. The AAA company rating was introduced in 1989, and firms have had the opportunity to demonstrate their business reliability in the form of certificates as well since 1996. The certificate provides means for the eligible companies to show to others that their companies are recognized, reliable and creditworthy undertakings.